Hosts Rwanda earned a place in the quarter-finals of the 2016 African Nations Championship with a 2-1 win over Gabon in Kigali as Ivory Coast secured their first points of the campaign with a 1-0 win over Morocco. Ernest Sugira scored both of Rwanda's goals in an eventful game, whilst Yannick Zakri Krahire proved to be Ivory Coast's match-winner from the penalty spot. Rwanda went top of Group A with a maximum six points as Ivory Coast moved up to second, three points adrift. 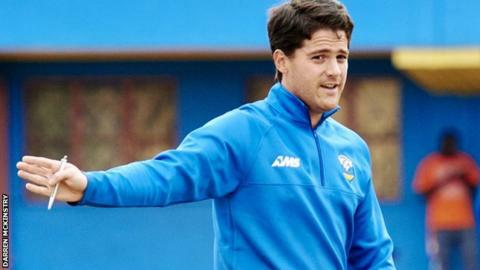 Rwanda, coached by Johnny Mckinstry (pictured), took the lead against Gabon shortly before half-time through Ernest Sugira. He then grabbed a second moments after the break, firing a superb shot into the top corner from an angle. Aaron Boupendza pulled one back for the Panthers, heading home in the 53rd minute. Gabon's hopes of finding an equaliser were dented just four minutes later when Tchen Kabi was sent off for a second yellow card after he fouled Dominique Nshuti. Despite being a man down, Gabon pushed for an equaliser and hit the woodwork shortly before the end of the match and then also squandered a good chance in injury time. Rwanda held on to become the first team to qualify for the quarter-finals at the tournament for locally-based players who play in their own domestic leagues. The second Group A fixture in Kigali proved to be much tighter, with Ivory Coast sealing the win over Morocco with a solitary goal on the stroke of half-time. After both sides missed opportunities early in the first half, it was Ivory Coast who took the decisive lead. Yannick Zakri Krahire scored from the penalty-spot to earn Ivory Coast the win and boost their campaign. The victory brought them their first points of the 2016 tournament, after they lost 1-0 to Rwanda in their opening match. Morocco fell to the foot of the table, having already drawn 0-0 with Gabon in their Group A opener. The final Group A matches are on Sunday, with Rwanda playing Morocco while Ivory Coast play Gabon at the same time.